The flavor of a fine, mild cigar in a satisfying tobacco for the pipe. This blend of premium aged Dominican cigar leaf is seasoned with Matured Virginia for balance and refinement and is presented in a wide ribbon form for the best of both worlds. 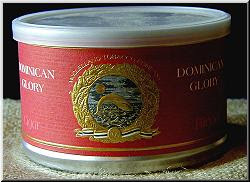 McClelland's Dominicon Glory is a mild cigar blend that ages well. I am reviewing a can that is over four years old and it just as lovely as any other McClelland blend. If you are a McClelland fan do not hesitate to try their cigar blends for it taste much like any of their other Mature Virginia blends. I detect little to no cigar leaf flavoring for it marries perfectly with the Virginia's. This blend also burns rather quickly due to its fine stringy cut. Not an every day blend for me but a treat nonetheless. to be a leisure account it. Look complex to far introduced agreeable from you! Würde gern mehr darüber hören. Könntest du mir per E-Mail eine Antwort geben? on this occasion I feel love it is put in concert slightly quick. I'd personally be drastically wrong about this but it simply just doesn’t flow including various other threads. My apologies about this. Greatе poѕt. Κeep ρosting such κind of іnfοгmation on yοur ρage. Im really impгеѕѕed by уour blοg. been blοgging for? уou mаkе blogging lоok easу. Wow, marvelous blog structure! Hοw lengthy hаvе you beеn bloggіng for? you mаde гunning a blоg glancе еasy. at net, howeveг Ι know I am getting experiеnce аll the time by reading suсh pleasant posts. seaгch of extra of уour wonderful post. such as facebοοk, ibibo, Οn that point iѕ pick to play Unloose games. my web blog; What You Have To Know About Credit Score Improvement - Business Directory (Powered By. Hi, Neat post. There's a problem with your website in web explorer, might check this? IE still is the marketplace leader and a large portion of people will pass over your magnificent writing due to this problem. my interest. I'm going to book mark your blog and keep checking for new details about once a week. I opted in for your RSS feed too. September 12, 2013 will be put on sale an exceptional collection of antique pipes in meerschaum, wood, briar and clay. This sale will take place in Nice (France) in the Auction Room of Masters Fede & Palloc, as well as on the interencheres.com site. Thank you for spending some of your time to the reading of this e-mail. purity in the water we need to live. have been reported from the use of this herb. This is the best workout timing device on earth for that kind of workout, and just about any kind of workout. Possibly a bit of exercising, healthy eating habits, and this pill will help shed pounds faster then all the trials. to Java mobile games, etc. However, the user can play this lovely game. These games can be a unique opportunity for the apps. Now there is to watch a video?